Start the day with this quick and easy treat served with freshly-brewed coffee, or enjoy as a dessert after an informal midweek meal. Place the eggs, crème fraîche, cinnamon and caster sugar in a bowl and whisk together until frothy. Dip the slices of bread into the mixture, turning them over a couple of times to make sure they are well coated. Melt half the butter in a large frying pan until foaming. Fry the pieces of bread for 1 minute on each side or until lightly browned and the egg has set. Cut each piece in half and arrange on 2 warm dessert plates. Heat the remaining butter in the frying pan, add the peach slices and cook over a high heat for 2-3 minutes, turning once, until lightly browned. 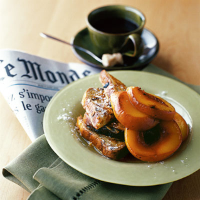 Add the orange liqueur, if using, then spoon the peaches and their juices over the toast. Serve straight away, topped with a dusting of sieved icing sugar. Have everything ready to dip and fry before you sit down to your main meal. Waitrose Perfectly Ripe Nectarines or seasonal persimmons are excellent substitutes for the peaches in this recipe.